Cartagena’s decade long struggle for independence included 2 protracted sieges and an oppressive Spanish occupation. While its heroic role would forever be remembered in Colombia’s history, the city suffered a century long stagnation as a result of the wars for independence. Read on for a complete history of the consequences of Cartagena’s independence. 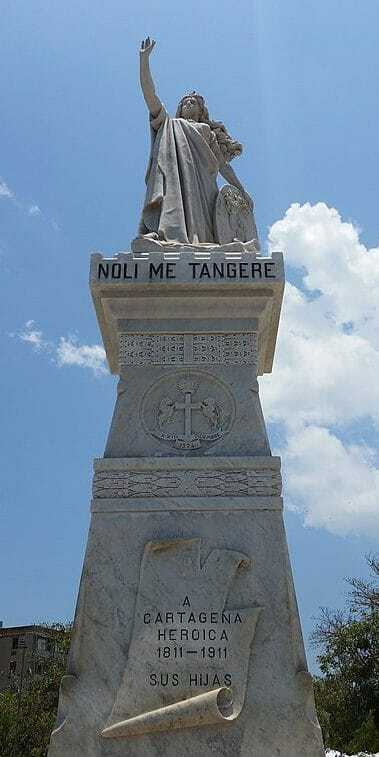 Monument to those who lost their lives in the struggle for independence, including 9 Martyrs of Cartagena. This year was without a doubt the best year for the Cartagena Independence Festivities in recent memory. The parade and all the other events were well organized, there were more famous musical artists performing than ever, and the city got to really shine! Congratulations to Allison Vega, named Miss Independence, and Gabriela Tafur from Valle, named Miss Colombia, just edging the candidates from both Bolívar and Cartagena. Hopefully 2018 is a sign of even bigger and better things to come for the fiestas. Big props to the IPCC for their work this year! Now a look at the historical consequences of Cartagena’s independence. After the decisive Battle of Boyacá, most of the colony of New Granada was effectively free from Spanish rule, with just a few pockets of loyalist resistance. One of these was Cartagena, which was not liberated until 1821. (*Read more about the liberation of Cartagena here). 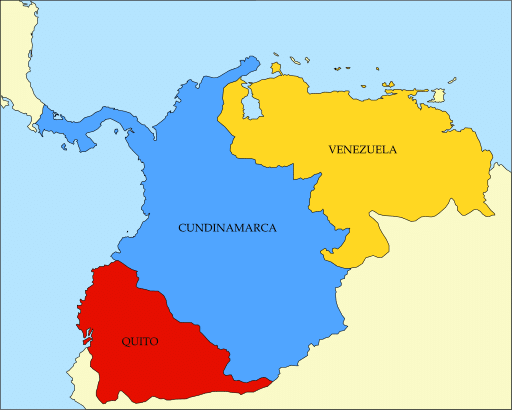 In late 1821, the Congress of Cúcuta declared the creation of a unified republic of the modern day countries of Ecuador, Panama, Colombia, and Venezuela. This republic was called the Republic of Colombia, although it is usually referred to as Gran Colombia today to distinguish it from the modern day republic of Colombia. The unified state was a centralized one with a strong presidency, based largely on the ideas of Simón Bolívar, who was named President and thought a large and strong state would help prevent outside aggression or imperialist dominance. After its liberation, Cartagena joined the union and originally held jurisdiction over nearly the entire Atlantic coast of modern Colombia, from the Isthmus of Panama to La Guajira Peninsula. Its bay served as the stating ground for the preparation of the fleet that defeated the Spanish the Battle of Maracaibo in mid-1823. The Liberator Bolívar visited Cartagena in 1827 to great fanfare. 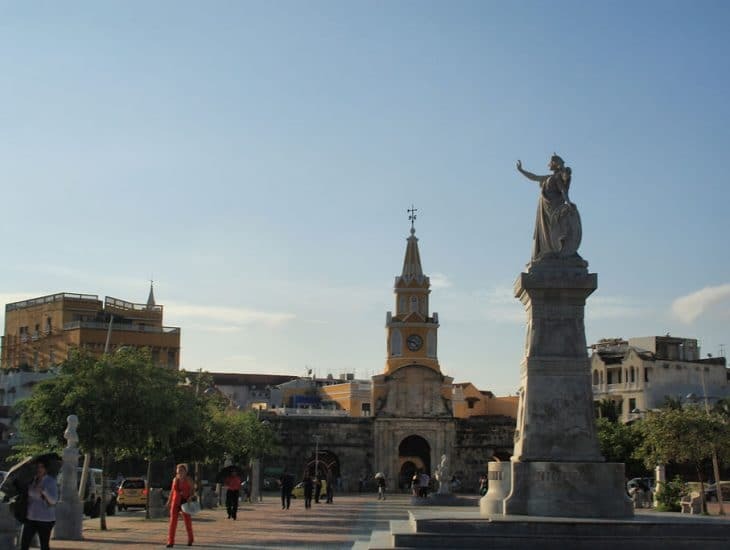 He had earlier spent time in the city in 1812 and had coined the nickname of La Heroica for the city (*Read more about Bolívar’s time in Cartagena here). He spent nearly three weeks in the city and was hosted at countless banquets and celebrations. 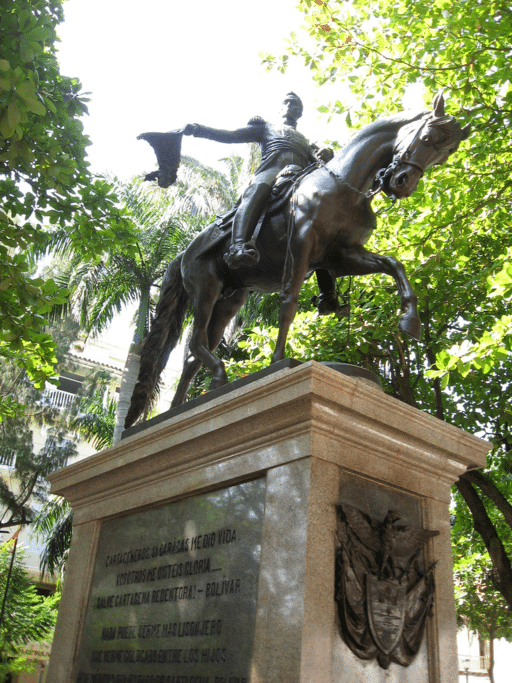 Upon leaving, he parted by declaring that “if Caracas gave me life, you gave me glory” and “your brave city has saved the homeland.” (These quotes appear on the monument to Bolívar in Bolívar Plaza in Cartagena today). Monument to Bolivar in Cartagena. Image Source: Wikimedia Commons. However, Boliívar’s and Gran Colombia’s honeymoon period was short lived. Even by the mid-1820s, the republic faced the same types of division and internal strife that Bolívar had warned would frustrate the aspirations for independence in his 1812 Cartagena Manifesto. Many local leaders favored a more federal system that gave them more control and authority over local affairs. Among the most fervent of Bolívar’s rivals was vice president Francisco de Paula Santander. As Bolívar became increasingly dictatorial in his effort to hold the union together, conflict and conspiracy became the norm. There were several attempts on his life, including one in which Cartagena’s heroic naval general, José Prudencio Padilla was falsely accused of being involved and executed. With the union in tatters, Bolívar resigned the presidency in 1830. He passed through Cartagena, where he was bed ridden and sickly from tuberculosis and disillusionment for several months before continuing on to Santa Marta where he died on December 17, 1830. Unfortunately, it did not, and Gran Colombia officially dissolved in early 1831. Ecuador and Venezuela went their separate ways, and the area of Panama and Colombia became the Republic of New Granada. Map of Gran Colombia showing the 3 departments that formed separate republics upon its dissolution. Image Source: Wikimedia Commons. Unfortunately, the former of Bolívar’s words mentioned above probably rang true to many of Cartagena’s citizens for a long time after independence. While the city’s leading role in being the first place to establish an independent state in Colombia had earned it praise, the consequences of Cartagena’s independence would largely be negative. The city suffered from continued threats of attacks from internal and external aggressors, economic decline, and population loss. Even after the dissolution of Gran Colombia, the newly minted Republic of New Granada followed a similar pattern of internal strife. Ironically, Santander, who had bitterly opposed Bolívar’s centralist vision for Gran Colombia, instituted a similar one for the smaller republic. Therefore, continued conflict would play out between centralists and federalists for much of the 1800s, often involving Cartagena. The city was repeatedly put under siege during these internal conflicts as well as being threatened by European powers several times throughout the 1800s. None of these sieges proved to be as devastating as the 1815 siege by the Spanish, but they helped contribute to the city’s lack of growth and recovery. One of the more interesting was in 1831. There was a rebellion in Barranquilla and other towns north of Cartagena. General Ignacio Luque was sent to put it down, and scored a quick victory over the rebels in the town of Sans Souci. However, when he entered Barranquilla, the rebels welcomed him with a party. According to popular legend, Luque, who was known to be a heavy drinker, was converted to the rebel cause after downing copious amounts of aguardiente. Regardless of the actual reasons why, Luque then led a force to besiege Cartagena. The city surrendered, but not long afterwards, the people expelled Luque. In 1840, during another rebellion, an army from Santa Marta led by Franciso Carmona, marched on Cartagena and laid siege to it. His forces occupied Getsemaní and they and the city’s garrison inside the walled city engaged in a 45 day artillery battle, before Carmona surrendered. In 1851, Juan José Nieto took power in Cartagena after a rebellion and civil war within the state of Bolívar. After winning, he declared the state independent from the Grenadine Confederation (the name of the national union at the time). Nieto then took Santa Marta by force and marched an army into Antioquía before he was defeated in 1864. In yet another name and government change, the United States of Colombia was created in 1863 and created a federalist system of government. The state of Bolívar suffered severe political instability in this period with 34 different presidents in 23 years. Included in this period was an episode on the night of December 8, 1876 where various politicians were murdered at the plaza outside the city walls named for Cartagena’s 9 Martyrs. 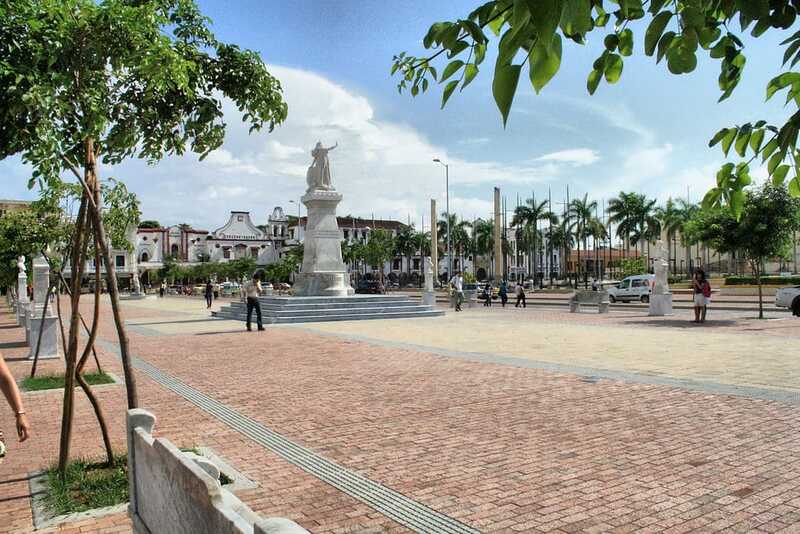 View of the plaza with the busts of the 9 Martyrs of Cartagena from the Clocktower. In 1885, a radical faction of the Liberal Party led a rebellion in resistance to centralist reforms. Among its leaders was Ricardo Gaitán Obeso. After taking Honda, the Magdalena River, and Barranquilla, he laid siege to Cartagena with 3,000 men and a fleet of 6 warships. However, as 2 armies approached from the interior of the country, Gaitán Obeso attempted a desperate frontal assault on the night of May 8, 1885. Like the ill-fated assault of Sir Edward Vernon nearly a century and a half earlier, it was a disaster. Many of his men were massacred, and he was forced to surrender and was imprisoned before dying a year later. Cartagena was also the subject of several cases of foreign aggression against the fledgling independent republic. In the type of bullying typical of Europe in the 1800s, several fleets arrived off the coast of Cartagena in an effort to extract concessions from the national government. Fortunately, however, none of them actually fired on the city. In 1834, a French fleet was sent to blockade the city after a French official was falsely accused of and imprisoned for murdering a plantation owner. Fortunately the official’s name was cleared and he was paid compensation for the insult and the fleet was recalled. In 1837, a British fleet did arrive and blockaded the city in protest of a legal conflict between a British government official and a Panamanian citizen. The fleet only left after the Brit received a favorable resolution and the payment of a indemnity. Another British fleet returned in 1857, demanding payment from the national government of a debt dating to 1825. It had orders to bombard the city. However, a yellow fever outbreak among the British sailors led to their commander asking to bury his dead in the city. The governor of Cartagena, allowed not only that, but ordered citizens to take in and care for the sick. This act of generosity led to the commander asking his superiors to revoke the order to fire on the city, and the fleet left. Finally, in 1898 an Italian fleet arrived under friendly pretenses, but after being hosted by the city for two days demanded a payment of 20,000 pounds sterling. The episode led to anti-Italian riots in the streets, but ultimately the national government was forced to make the payment to prevent the bombardment of the city. Cartagena had occupied a privileged position in the colonial economic system. As the designated port of trade, it not only held a virtual monopoly on the collection of customs duty, it also received a tribute from the rest of the colony to fund its defense. This tribute alone had made up half of the city’s treasury in 1808. With independence, Cartagena lost both of these privileges. Further complicating matters, was the loss of much of the city’s political and economic elite through fighting, imprisonment or execution by the Spanish, and emigration. Additionally, the deterioration and build up of silt in the Canal del Dique, the crucial link between the bay and the Magdalena River, made it more difficult to navigate. 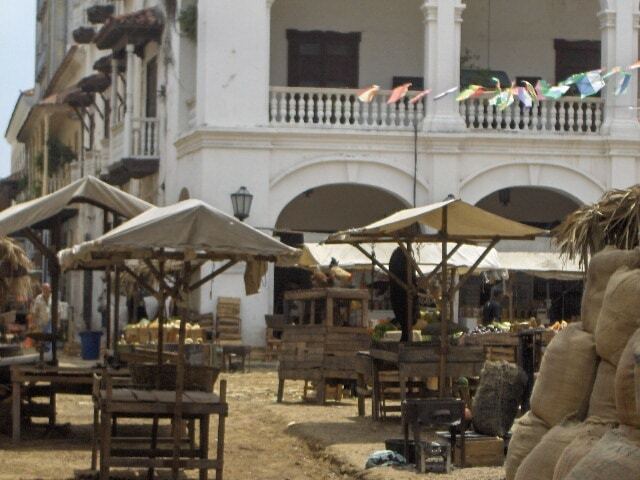 With these difficulties and competition opened up, Cartagena’s trade declined. Santa Marta, long Cartagena’s rival, was the first to benefit. However, both would eventually take a backseat to Barranquilla, located at the mouth of the Magdalena. The strong currents where the river met the Atlantic had been difficult to navigate, but with the advent of steamships, they became more navigable, and Barranquilla rose as the preeminent port, a status it continues to hold today. With the ongoing centralist and federalists conflict in the republic and the neglect Bogotá often showed to its provinces, including Cartagena, the city also lacked investment in its economy. It would remain stuck in a long period of economic decline until the early 1900s, and even today lags behind many of the other major cities in Colombia. Another one of the important consequences of Cartagena’s independence was population decline. With as many as a third of the city’s population dying in the 1815 siege of Cartagena, the execution of many by the Spanish occupation, and likely many just fleeing the violence, the population had declined considerably during the wars for independence. Further contributing to the population loss was a devastating cholera epidemic in 1849. The outbreak caused up to 4,000 deaths and again reduced the population of the city by a third. While not specifically stated, Cartagena in this period inspired the setting of Gabriel Garcia Marquez’s book Love in the Time of Cholera. This outbreak along with other, smaller ones and the ever present threat of tropical diseases like yellow fever helped prevent significant population growth. It would not be until the construction of an aqueduct in the first decade of the 1900s that the city first had running water, and its construction undoubtedly helped sanitation in the city. The economic decline discussed above likely only further contributed as the city would have failed to attract new citizens and others may have chosen to go elsewhere in search of opportunities. Cartagena’s population would not reach and exceed its numbers before independence until after the start of the 20th century. The harsh consequences of Cartagena’s independence would not began to truly be offset until the late 1800s and early 1900s. One key factor in helping spur the city’s revival was the rise of one of its sons to the presidency of Colombia. Rafeael Nuñez, born in Cartagena in 1825, became President of Colombia in 1880, after an already illustrious career as a journalist, congressman, and diplomat. As a moderate liberal, he tried to roll back the federalist tendency that had led to the different states of Colombia acting independently and fighting amongst themselves, what he called “organized anarchy.” Focused on nation building, his platform had called for increased unity. 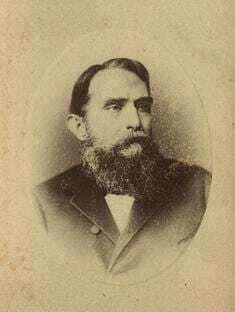 He faced a rebellion from the radical wing of his own Liberal Party after his reelection in 1885, a rebellion that led to the siege discussed above. However, it was defeated and Nuñez achieved passage of a new constitution in 1886. In it, the again renamed Republic of Colombia was made a unitary state. After being reelected a third time in 1893, Nuñez resigned and spent his last days at his home in Cartagena (now a museum). Nuñez’s presidency also helped jumpstart an economic revival in Cartagena. He helped secure funding for a railroad between Cartagena and the town of Calamarí on the Magdalena, allowing goods to once again flow from the port to the interior of the country. The aforementioned aqueduct also helped, as well as the first sugar mill in the country, founded in the opening decade of the 1900s. In more recent times, the Canal del Dique was fully modernized in 1951. The same year saw the construction of a road between Cartagena and Medellín, connecting the city to the interior by land for the first time in history. The construction of the oil refinery in Mamonal and growth a petrochemical industry around it also helped to revive the economy. The early 1900s also saw both Colombians and European visitors noting Cartagena’s potential as a tourist destination, with beaches, warm weather, and charming historical architecture. Some investment began in the tourist sector and gradually grew. Today, Cartagena is Colombia’s tourist capital with hundreds of thousands of visitors every year. While, Cartagena would never regain its status as the preeminent port or prosperous center of wealth it had been during the colonial era, all of these factors helped to restart growth in the city and restore at least some of its former glory. Despite the harsh consequences of Cartagena’s independence, that glory lives on today in the legacy it played in the independence of Colombia and the country’s and city’s honor of it. 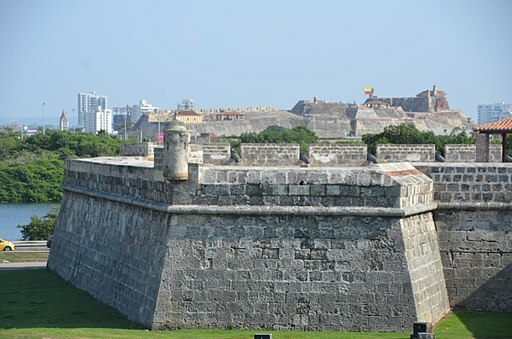 Interested in learning more about Cartagena’s Independence? 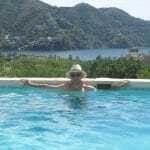 Planning a trip to Cartagena for the Independence Celebrations? Check out our Primer on the History of Cartagena or our more detailed, Comprehensive History of Cartagena. Be sure to visit Cartagena’s Inquisition Museum and Naval Museum to learn more about independence. Check out these books on Amazon: No Limits to Their Sway: Cartagena’s Privateers and the Masterless Caribbean in the Age of Revolution and Breve Historia de Cartagena and Breve Historia de Cartagena 1501-1901.